I will preface this post by saying that I am not old. Far from it actually. I am only 27, soon to be 28. But somehow, my body has not gotten the memo that I am not older than my years. I am always tired, and the gray in my hair is beginning to be more than just a "once in awhile" type of thing. I have also begun to notice a few nice little fine lines and wrinkles were there previously were none, and I do not like that! I am not ready for that stage of my life yet! Luckily, the fine folks at Murad know how to combat all skin issues, including the super fun signs of aging! 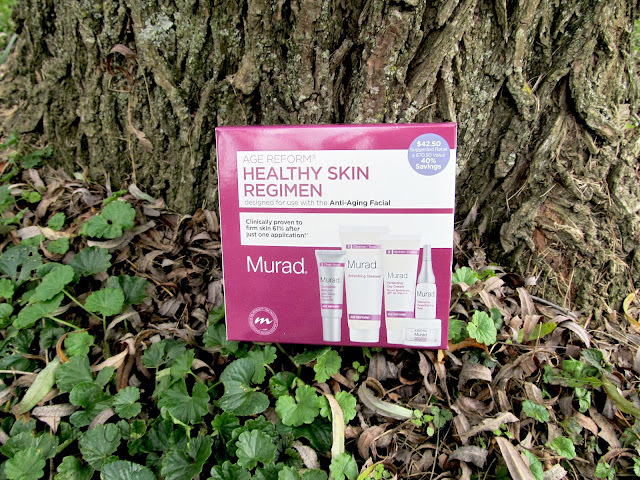 When we received a sample of the Healthy Skin Age Reform Kit from Murad, I was thrilled! I have to admit, I haven't always been the best about taking care of my skin... I hardly ever remember to wear sunscreen, and years of going to bed without taking my makeup off has really taken a toll on my skin. I wished that I could get my skin back to it's youthful look that it used to have, and Murad was able to grant my wish! 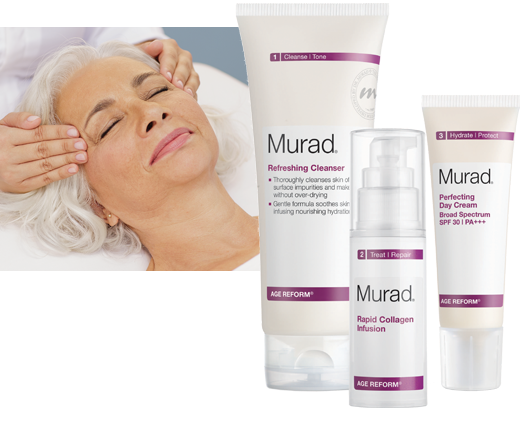 These great new Murad Healthy Skin Regimine kits are a part of a joint effort with Murad and Massage Envy, to offer great skin care options to their clients as an add-on with their facials! What a great idea! There are four different kits to choose from: the Age Reform Kit, the Resurgence Kit, the Environmental Shield Kit, and the Acne Complex Kit. These kits are super affordable, ranging between $36 and $45 each and they each contain five different products to help solve all your skin care issues! You can get these kits at Massage Envy spa locations nationwide, but I think the best bet is to surprise the person on your list with a Massage Envy gift card so they can pick the kit they like the best, and get some (much needed!) pampering in while they're at it! 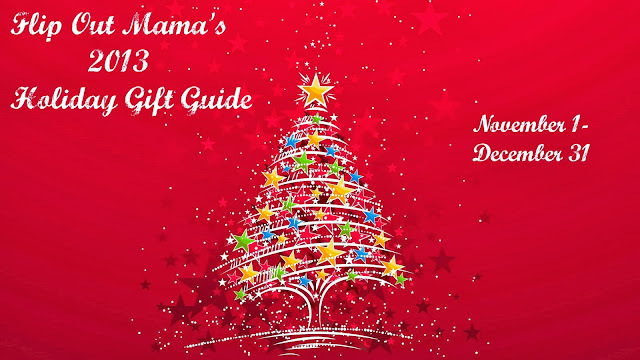 Everyone likes to be pampered and taken care of, so why not give the gift of pampering this holiday season?? Whether it be your mom, your sister, your grandma, your best friend, your kid's teacher, your co-worker, your babysitter... I can't think of any woman who wouldn't like to be pampered for the holidays, can you?? I have been using this kit at home for about a week, and I am happy to report that I can really see a difference in my skin! My skin is SO much softer than it was before, and my skin tone has really evened out. I also think my skin has more of a glow to it than I have noticed in a long time. Love it! I am so glad that I have found something to help combat the wonderful effects of getting older! Want to pick up one of these for yourself or for someone special on your Christmas list? You can check out Massage Envy's website for more information, including where to find a spa near you! Oh, and if you wanna stay up to date on all the news, promotions, and exciting offers from Massage Envy and Murad make sure that you "like" them on Facebook and follow along on their blog!